International organizations become more and more important in the process of globalization. In recent years, the number and scope of measures taken by the UN has increased accordingly but also the legitimacy concerns related to these measures. The question of how to control and legitimize the activities of the UN is thus ever more pressing. 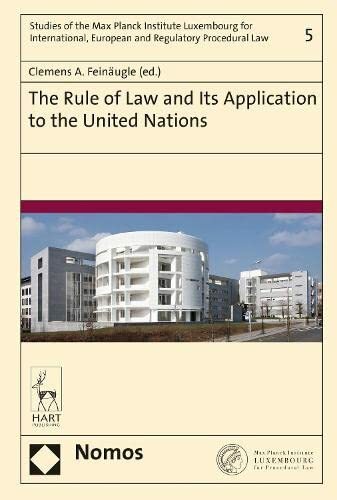 While recent works on the rule of law in international law prove the timeliness of the topic, these questions concerning the UN have never before been addressed in a scholarly work in a comprehensive manner. This volume serves this purpose. Clemens A Feinaugle is a Senior Research Fellow and the Coordinator of Scientific Research at the Max Planck Institute, Luxembourg.